FINALLY! After many days of waiting, I finally completed my tie skirt! I'm so so so happy with it. Well I knew people wanted to see pics of one, so I certainly have tons of pics here. It's actually very simple. Hopefully the instructions are understandable, if not please feel free to ask questions! Enjoy! 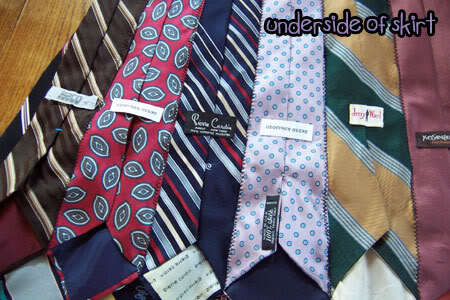 Gather a bunch of ties. For my waist I needed 15- but depending on your size you may need less or more. Measuring your waist and the width of the ties helps here. Decide how long you want the skirt. I wanted mine to my knee, which was 19 inches. However, when you sew them together they tend to bend to one side, I'm not too sure why. 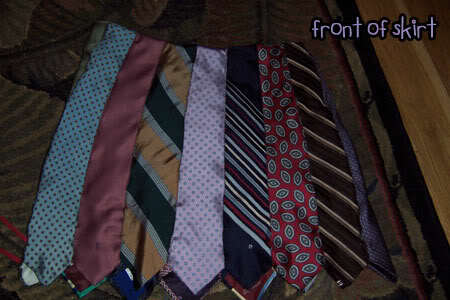 Because of this I added about 6 inches to the 19 and sewed the ties so that they were sewed to the 25 inch point. This also allows for a waistband. Pin together the ties and, using a zig-zag stitch, sew them together until the point where you wanted to stop (I stopped at 25 inches). 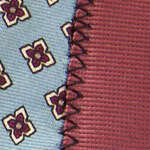 Be sure to backstitch at the place where the pointy ends of the ties meet. Here's what it looks like when they were all sewed together. A detail of the stitching. 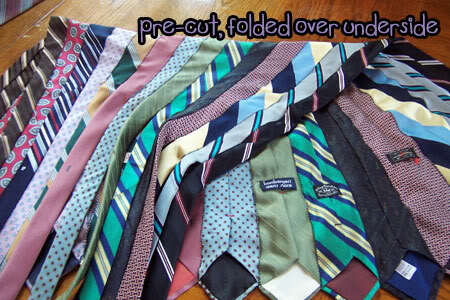 The underside of the ties sewn together. Cut off all the excess ends (You now have lots of skinny ends that can be used to make chokers, bracelets, etc. Yay!) . Be sure to not cut off too much- it's always good to have a little extra. Try it on for size! This helps a lot at every step. Fold the top over so that it's at the right height and wrap it around your waist. 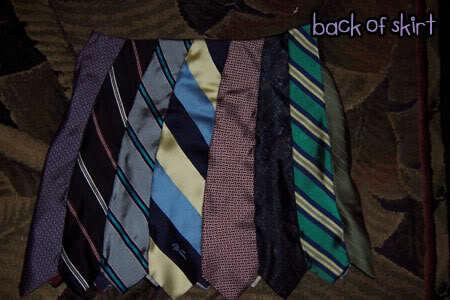 If it's too small, sew on more ties, and if it's too big, use a seam ripper to remove a tie or two. Here's what it looks like when I folded it over. You can see how the ties bend- at one side it's folded over a lot more. Once you have the size right, cut off any excess (but leave enough for a waistband) and sew together the two ties at the end so you have the basic "skirt" shape. However, since I used a zipper inbetween the last two, I left about a 6 inch space between the top of the skirt and the place where the zipper would end. 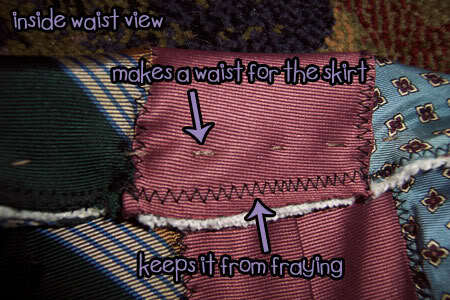 Use a zig-zag stitch around the top of the entire skirt so that the ties don't fray. 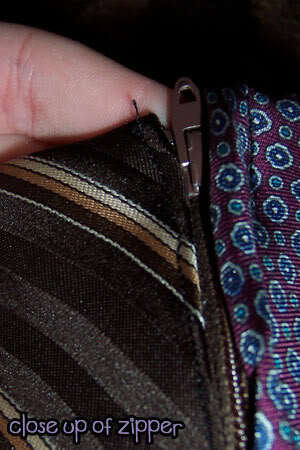 Then, using heavy thread, hand-stitch the top to the inside of the skirt so that it forms a waist. This shows the inside of the waist, where I used a zig-zag and then hand-stitched the top down. 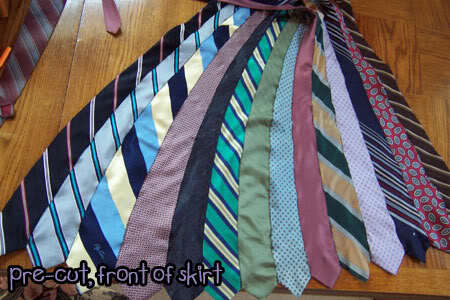 Now I had a basic skirt, with a 6-inch spot between two of the ties to put the zipper in. Put a zipper foot on your sewing machine, and sew the zipper into this spot. Here's the zipper when it's closed. 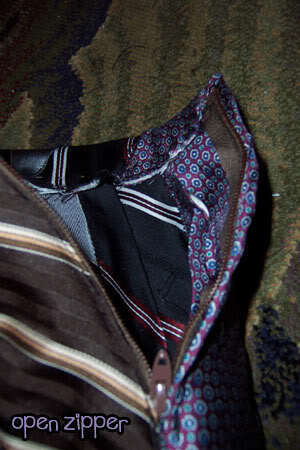 When I sewed it in I made a little flap out of the purple-polka-dotted tie so that it wasn't as noticeable. And here's the zipper when it's open. And you should be done! That wasn't so bad, was it? That is awesome!!! Excellent tutorial as well. wow...really? that has to be the first time anyone's ever told me that. thanks! you're too nice. Grr! I'm so mad at you. I wanted to be first! My skirt is almost ready to be posted. I just have to wait for my mother to help me with the zipper. Mine's slightly different, so I'll post it here perhaps if anyone is interested. That's so cute! Great job with it too! I have so many scarves...maybe it would work with them....oooh, I'm now inspired!